حاليا غالبية احتياجي من الملابس اهيا قطع عملية واقدر البسها بالدوام او انها تكون مريحة وتنلبس مع جينز بدون تفكير بس يظل شكلها مميز ومرتب بدون حوسة. هالاسبوع وصل الاوردر من ( اسوس ) وبناء على رغبة المتابعين قلت اشاركم شنو الاشياء اللي طلبتها . Lately, most of my wardrobe needs revolves around practical and workwear. Something professional and comfy yet making statement without so much effort, as I don't want to look basic nor boring. 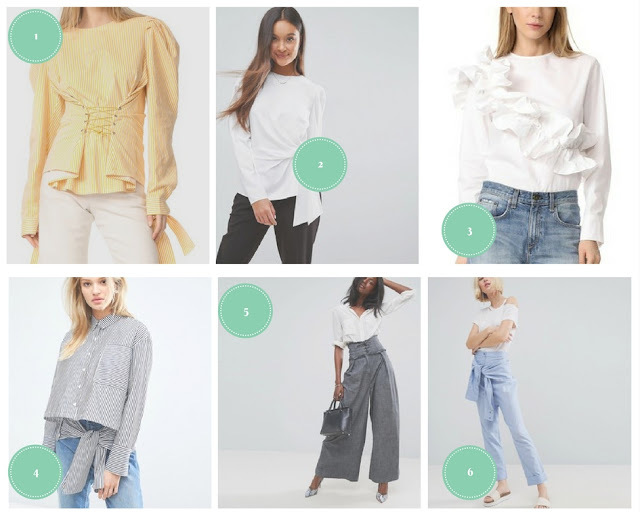 Most of my picks are from Asos, and I also recommend Shopbop. 1. Striped corset top, Here & Here. 2. Origami Top, planning to order this soon. 3. Adjustable ruffle top, Here & Here. 4. Oversized shirt with tie up details, I got this shirt too. 5. Corset wide leg pants. 6. Tie front shirting trousers. These all look amazing. I love statement pieces so I really should own a statement top.